I thought I’d talk a little today about altars and sacred spaces. What brought this topic to mind is the unfortunate state of the weather! We are having a lot of rain at the moment which is keeping us indoors more than usual. Nature is my favourite natural altar, but now that I am inside a little bit more, I am appreciating my home altars and sacred spaces as they provide little oases of calm and serenity. So what is an altar? Well for me it’s where I place images or items of any person, place or thing, which remind me to say Thank you as I pass. What I consider my main ‘altar’ area is actually on a wall-shelf on my stairs so that I pass it often and therefore am reminded often. 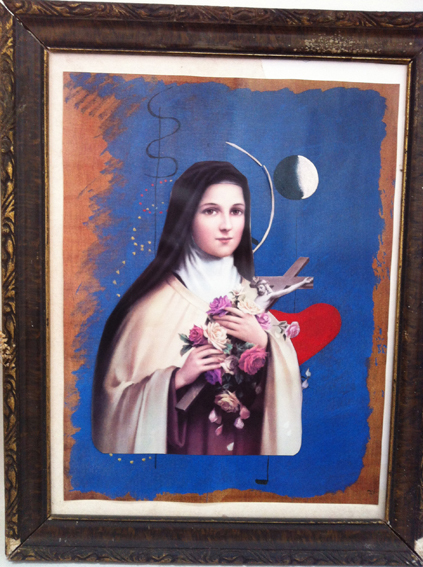 Included here is a collage I made of St Therese of the Little Flower on a backdrop of mainly a Joan Miro painting. St Therese I feel an affinity for because she had a very strong connection to the wider world, what I see as the multidimensional reality that is around us at all times, but of which we are not always so aware.The Miro background is an acknowledgment that my way might not be traditional or of a specific faith but that I can recognise the good in all faiths. 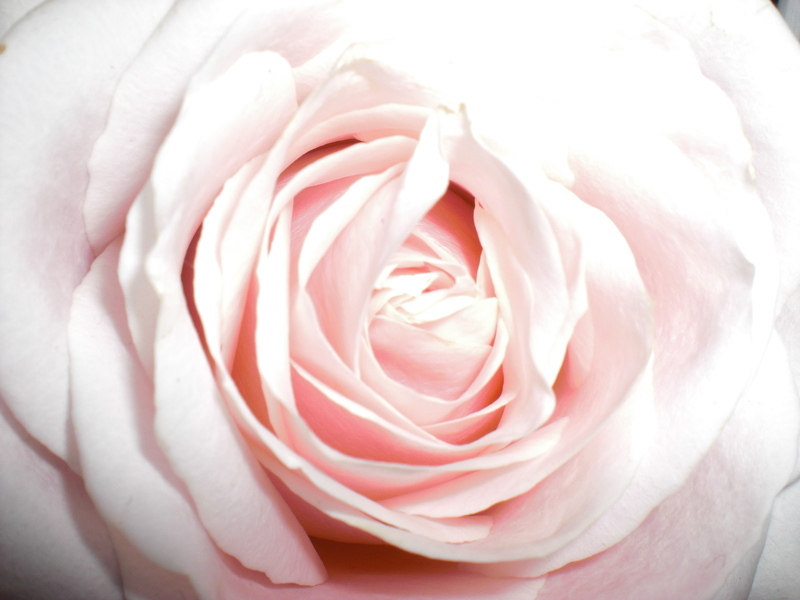 St Therese had a message that once gone from the body she would send a rose as a message to anyone who requested prayer through her and which she felt could be answered. Many people from all over the world say they receive roses and I am one of them! It’s not like they drop out of the sky but more that you get one within the time frame of the prayer and unexpectedly. In my case I had been handing over three issues to St Therese, many years ago now and out of the blue my father arrived with three red roses that he just felt the urge to buy for me! A lovely example also of him listening to the promptings sent to him requesting on a soul level that he be the conduit of my reply. I was delighted. The roses never disintegrated and so I have one of them also on my altar area to remind me that the world is indeed so much wider than we can ever fully know. Also on my altar are carvings of the Hindu Ganesha. As the remover of obstacles and the one who sometimes places obstacles to instruct, he is a good reminder of the dual functions of trust and acceptance. Also as an animal he is a personal symbol of my love of animals, and his appearance is also for me a nod to the strange and interesting history of our planet and some of the hidden histories that are not often explored. So for that reason Ganesha also serves as a reminder to keep me open. Included also are carvings of Mary and Jesus (as the Infant de Prague just because I like that statue). The energy of the Christ consciousness is very significant for me. Jesus was of course the ultimate healer and Madonna blue is my personal healing signature so I have a very strong connection and devotion to both Jesus and Mary. 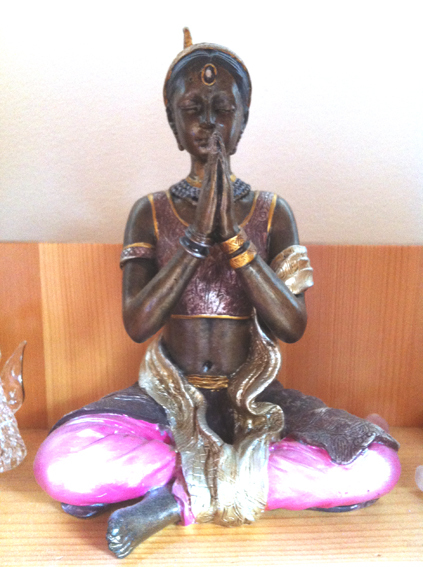 The Thai Buddha is there not just because I love Buddha statues and the gentle calm that Buddha represents, but also because it represents my daily practice of the techniques of Knowledge and my deep bond to my teacher Maharaji, and my gratitude to him for teaching me such a powerful practice and continuing to provide such an inspiring and cleansing teaching. The oil and diffuser sticks are symbols of my healing practice and the beautiful oils I use to cleanse the area. As much as I have learned many wonderful healing techniques over the years, I am also acutely aware that I have been given a natural gift that I must protect and treasure and the very simple clarity of the oil image reminds me to be grateful for this. Finally I include the non specific artifacts to include all the natural traditions of healing, faith, medicine, folklore, history, and the magic of the earth herself. This is just one altar of course. I have many sacred spaces in my house and many beautiful crystals and natural stones that hold the energy and bring the wisdom and beauty of the earth and nature inside. Do you like to create sacred spaces? Justina, thank you for this wonderful post. I feel a strong connection to Saint Therese, too. And I love your collage of her. My mother passed on October 1 which is the saint’s day for Saint Therese. My mom loved roses and had an amazing talent for arranging flowers. I woke up this morning thinking about her and here is your post! Thank you, again. And thank you, Mom and Saint Therese! That is so lovely Cathy.